I have discussed with my friends before about writing some articles of trees. A new topic ‘Ten pieces of wood tell ten stories’ is come out; the stories begin from the cross section of the trunks. We explain some characteristic of trees through them. They are Macaranga tanarius var. 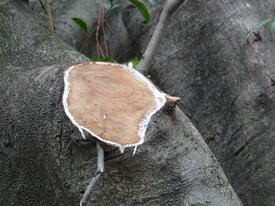 tomentosa (location where the bloody red liquid comes out), Ficus microcarpa (location where the milky white liquid comes out), Dimocarpus longan (diffuse porus), Spathodea campanulata (light weight), cavity (relate to structure), growth rings (relate to age of tree), the width of growth rings, ( grow up direction and progress), Cinnamomum camphora (prevents insects), etc. If we have better understanding, we can describe, explain and predict some characteristic and phenomenon of trees even we only have those trunks! The top left picture is a Ficus microcarpa with the trace of newly pruning. One of its features is the white sticky flowing sap. This feature protects the tree from the insect borers to eat into the trunk. 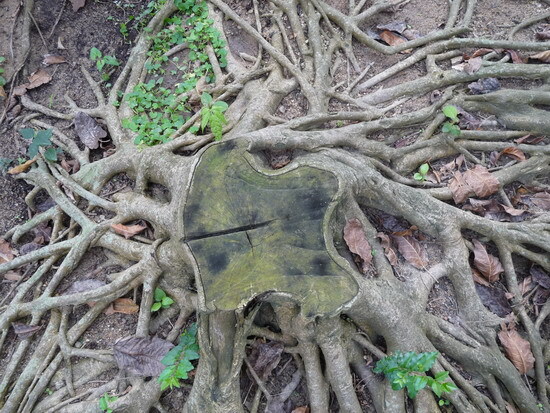 The top right picture is the root of a Ficus virens var. sublanceolata. 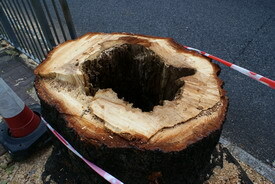 It is a kind of huge tree which needs to be supported by a strong and expanding root system. The top left picture is Macaranga tanarius var. 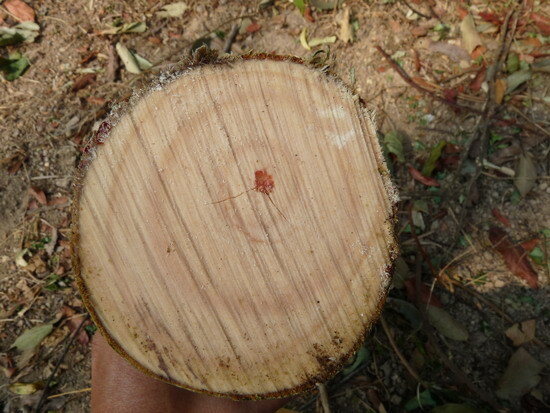 tomentosa, it is different from Ficus microcarpa , in which its bloody red liquid is come out from the pitch but not the outer circle; the growth rings show it was young and grew up rapidly! Its growth rings are narrow in right top hand side and broad in left bottom side have indicated that it has grown faster in the right bottom part. It may due to the shadow of other trees at the right top hand side or the sunrise at the right bottom hand side. The top right picture is an Aleurites moluccana with a big cavity at the middle of trunk. The emptiness does not imply it is unhealthy as the vascular vessels located at the outer circle is not damaged. The trunk is 70% empty but its integrity can be prevailed in the outer part. Therefore, it is still 70% structurally strong.